One collection you may not have spotted at your local Goodwill is the over abundance of amazing vinyl records that they carry at their store. The best part isn’t just how much fun it is to flip through them, but the easy-on-the-wallet price of a mere $.25 per record price tag! 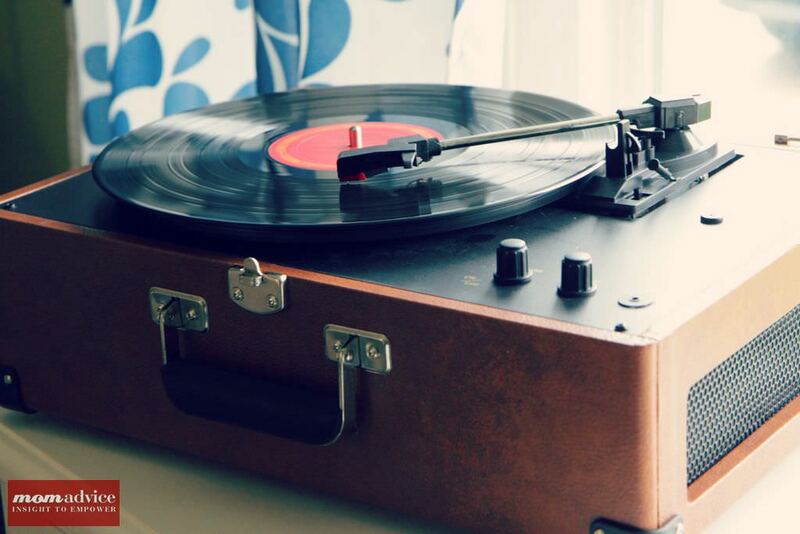 Have you caught on to the reemerging vinyl fad yet? This winter to celebrate my birthday and the launch of my book, my amazing friends all pitched in for a record player and my first stack of vinyl for my birthday. 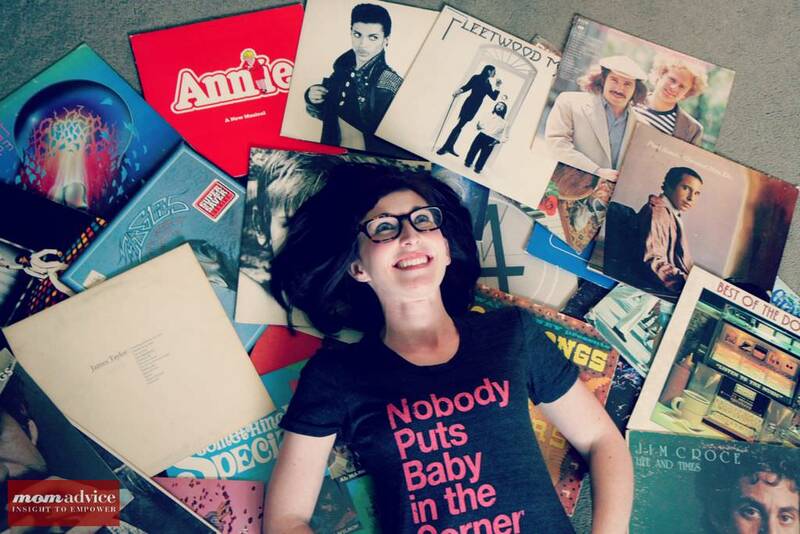 Since then, it has been my little weekly hobby while the kids are in school to head to the stacks of records at my store and spend an hour flipping through records to bring home to listen to over our evening meal. At a mere quarter, it is easy to get a little carried away with my record collecting, but it has proven to be the perfect thrifty hobby for me. There is nothing more fun than settling in with some of my favorite albums from my youth and hearing them on record, just like when I was a kid. 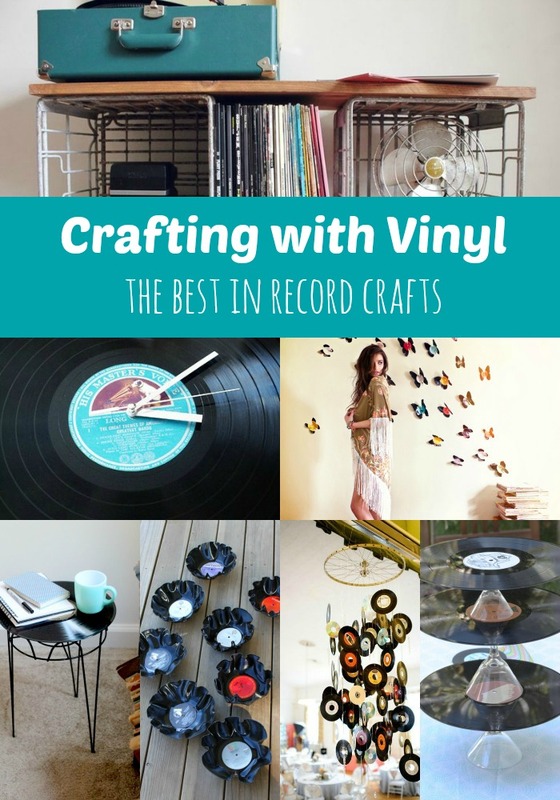 Records that are scratched can still get a great deal of love in your home and today I wanted to showcase some fun record craft ideas you could create for your home with these budget-friendly wonders! 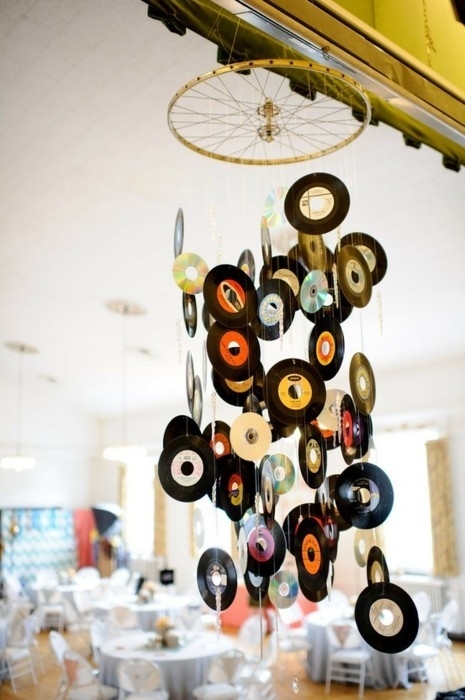 Did you know that you can create, cut, and mold shapes with records to make a wall decal? Me either, but I am so excited to try this amazing idea for decorating a wall as demonstrated in this easy DIY butterfly craft from Threadsence. I am already imagining all the possibilities with this craft and think it would be a fun way to dress up a craft room wall or a fun addition to a teen/tween bedroom. If there is one thing I love, it is easy crafts and you can’t get any easier than grabbing your hot glue gun and attaching a record to a plant stand for a side table. This little table would be adorable in any room or the perfect gift for the music lover in your life. Scratched records make the perfect little resting place for your morning coffee and breathe new life into a tired piece of vinyl. 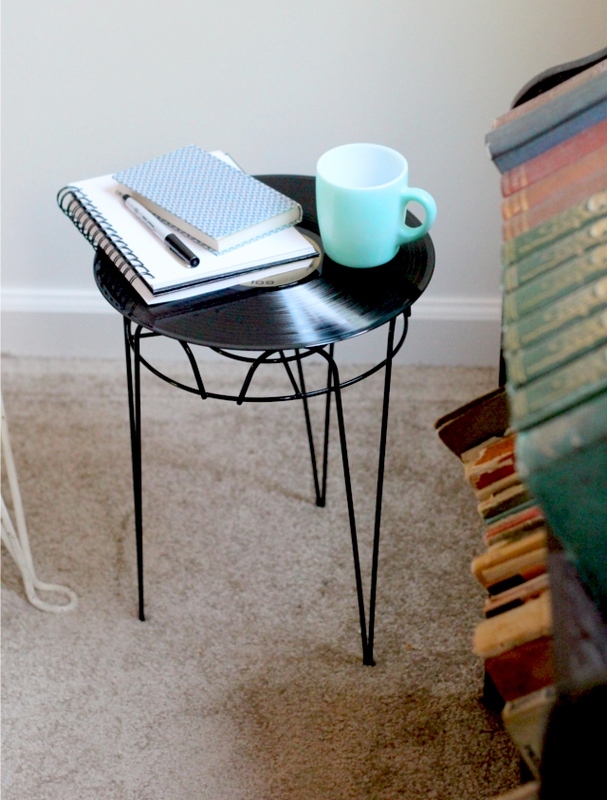 Check out The Flourishing Abode to create your own record side table. I am all about turning anything that I can find from Goodwill into a cake stand. Remember these adorable board game cake stands I created for a party? 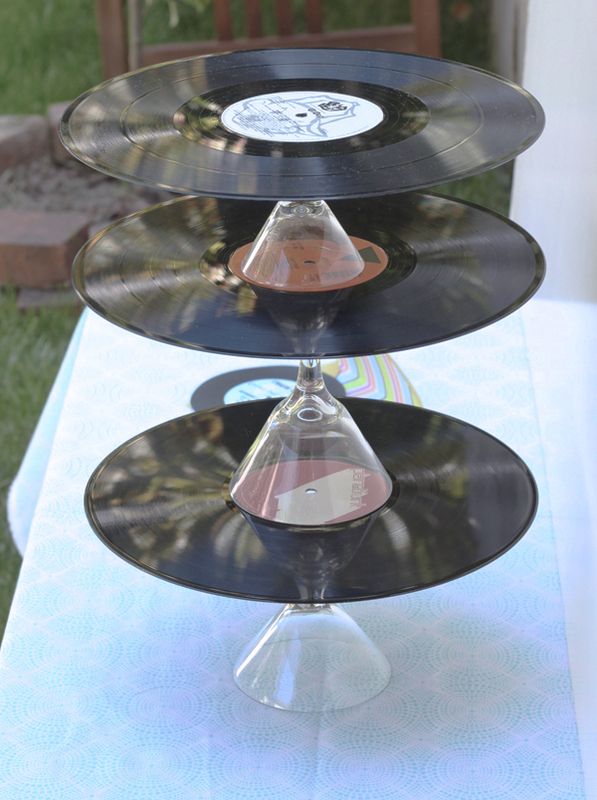 You can attach an inverted candlestick holder or martini glass for an easy stand for these. These would be adorable at themed parties you are hosting or just a fun way to serve up retro food for an evening with friends. Check out cake for the full scoop on this fun addition to a party. Wall clocks can be expensive, but a necessary addition to many rooms in your home. 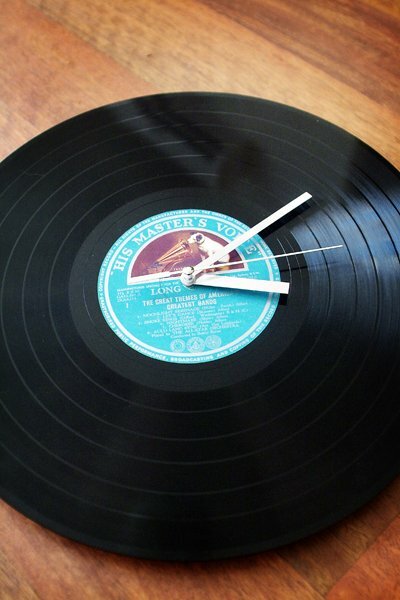 That is why I love this easy DIY Vinyl Record Clock idea featured on Apartment Therapy. Simply choose a record with a label that compliments the color of the room and use a few clock hardware pieces to create your own version for your wall. Can’t you picture one of these adorable clocks in a dorm or teen/tween bedroom too? I love it! Looking to add a fun fluted bowl to your party table? Just as was showcased in the wall decal craft that I talked about here, you can also shape and mold records into bowls to adorn your tables at parties. This easy DIY requires no cutting of records, but simply a heating and shaping of them to create these adorable bowls. I can picture popcorn, candy, or nuts as fun appetizers for a party. 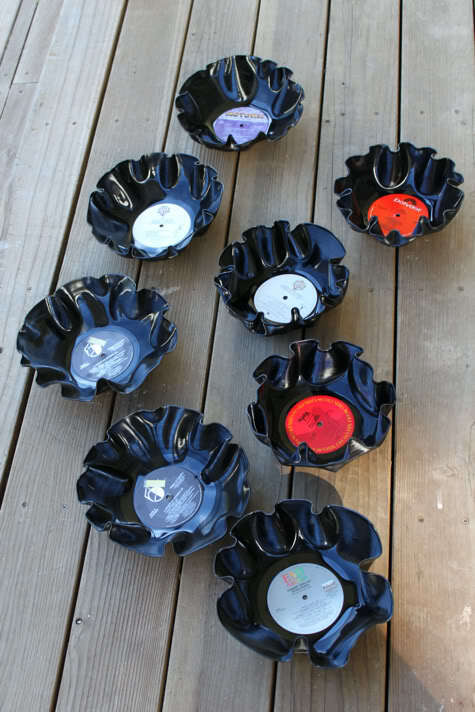 Check out Prudent Baby for this easy record bowl tutorial. 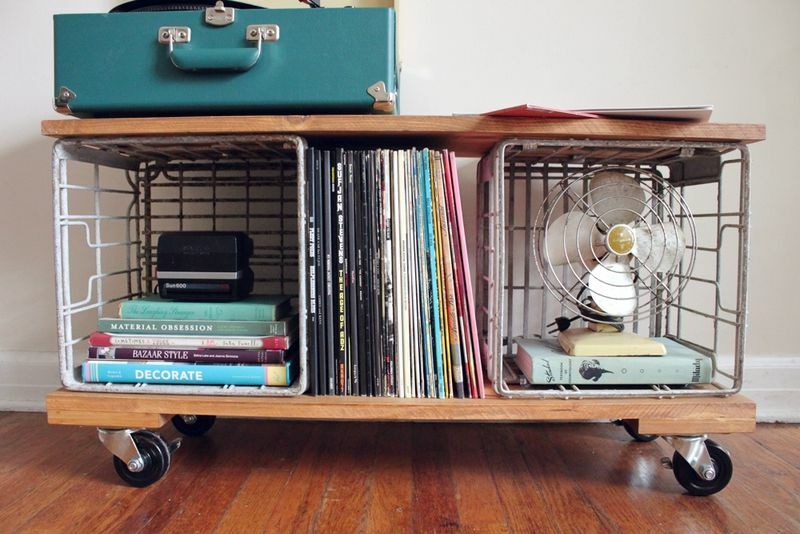 Don’t forget that you will need a spot to store your new-to-you record collection! I have fallen in love with this DIY Industrial Storage Cabinet on A Beautiful Mess for an adorable stand and place to display your favorite records. It looks like the cabinets I have been eyeing online, but is made at a fraction of the price. Of course, if you are heading to Goodwill every week like me, you might need storage that offers a little more room. I found this storage ottoman at our local Target for $80 and it created the perfect little spot for our collection. All of the records are flipped on the edges so we can see the titles and grab what we need easily. It also is a fun way to reveal your collection to your friends and enjoy an evening together around the ol’ record player! Happy record crafting & hunting, friends!